It is best to select a hedgehog that is between 6-12 weeks old. Young hedgehogs usually adapt to a new environment more easily than older animals. However, there are times when younger babies have a difficult time quilling and are more comfortable and social after the largest part of the quilling process is over. Hedgehogs over six months may still make good pets with extra precautions. 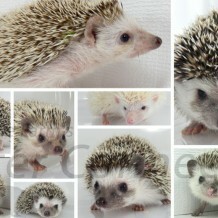 All hedgehogs should be easy to handle at the time of purchase. Each hedgehog will have it’s own personality, and it is best to choose the hedgehog that is similar to what you are looking for in at pet. However, the personality you see at the time of purchase will change and develop over time, depending on how you handle your new pet. Most hedgehogs will be a little nervous when they are first handled by a strange person or when they first wake up, but they should calm down and relax within a minute or two. The hedgehog should come out of a ball fairly quickly. Huffing is OK because that is part of hedgehog nature and communication. The hedgehog should not click, jump or pop, because that means it is trying to defend itself and it is trying to threaten you. You should be able to physically examine your hedgehog to ensure good health.